Mile Elgan, of "Mike's List" fame, has an interesting piece here, where he looks at the impact ASUS is having on the PC industry by releasing the Eee PC. The size, operating system, features, quality of construction, use of SSD storage, and price, all directly challenge the incumbent suppliers who have controlled the rate of change and pricing. Let's take a moment to ponder how cheap that is. This full-featured laptop costs $69 less than the 16 GB Apple iPod Touch. It's $100 less than an Amazon Kindle e-book reader. 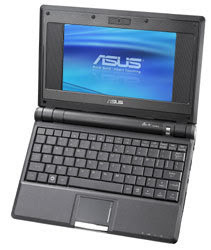 The most expensive configuration for the ASUS Eee PC on Amazon.com is $499." "The reason Microsoft hates Asustek couldn't be more obvious. The Eee PC runs Linux (Xandros running KDE) and uses an appealing and innovative tabbed-based user interface developed by Asustek. The device also comes with OpenOffice, a Microsoft Office replacement, and Firefox. The entire system -- hardware, OS, office suite and applications -- costs $30 less than Amazon.com's discounted price for Microsoft Windows Vista Ultimate alone. The Asus Eee PC is demonstrating to the world that its success depends on aggressively *avoiding* any Microsoft product."